Hello again and Welcome Back. 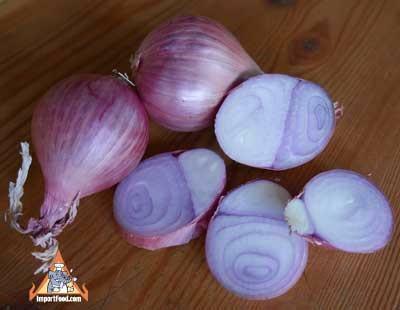 See our ideal quality fresh shallots, just harvested. Lots of Thai Cookware is back in stock, Nampla Wan and Pad Char are back, and more. Thanks for visiting! Very fresh, grown in Washington State in excellent climate, and shipped all over the world (notably Japan and Korea -- prized for the high quality). Export quality and could not be better. Order Fresh Shallots and Also Receive 8 Stalks Fresh Lemongrass plus a small handful of Fresh Red Thai Chiles at no charge. Thai Ovaltine is true to the original British formula, unaltered like the American Ovaltine which has been changed over the years to add more sugar. Richer barley malt flavor. Also loaded with vitamins, and tastes just like you remember. These ground red Thai chili peppers are strong but not overpowering, a very nice medium heat pickled pepper. We enjoyed serving this along with barbecue steak. We also put it in a small bowl and added some fish sauce -- a very tasty dipping sauce. Plum sauce is great as a dipping sauce for fried tempura and spring rolls. Koon Chun brand is one preferred by chef's--very good quality. Made in the United States, this is the brand of sriracha which has become popular and served all over the country, also called Rooster sauce. New fresh stock. Very spicy. Out of Stock for nearly a year. New shipment arriving next week. Found in most Thai homes, the 'Tao' is a small convenient way to cook outdoors. Now more efficient than ever thanks to a new design. Using very little charcoal, this cooker produces enough heat to stir-fry small or large woks, boil water, or barbeque meats. We're importing this from the innovator who is credited with the improved design. Fresh, hand-poured, home-made popsicles are a rare sight in Thailand these days, and we've certainly never seen an ancient-style Thai popsicle maker in USA. Fully-functional and ready to use. Many people have asked for this but it's been out of stock since last year. Both 40 Tube and 80 Tube available. Custom-made of very thick (1/4") steel, these flat woks are made for street vendors and restaurants, not home use in Thailand. Weighing 45 lbs, with a massive 20" diameter, this is not something you can move around in your kitchen. It would only be suitable for a serious outdoor home chef or a commercial kitchen, or perhaps someone interested in cooking at local street fairs. Handcrafted Santoku Knife, Blue Steel. $165. Crafted entirely by hand in Sakai Japan. Blue Steel (so-called because of the blue paper wrapping the steel as it comes from the foundry in Japan) is extremely hard and ideal for making knives that stay sharp with months of constant use. We only have 12 more of these which just arrived. Our last shipment came in July and was sold out in a few days. These are one-of-a-kind and would be considered among the finest knives in the world. Everyone needs a good sharp small knife. Here's one we imported from Thailand offered at a very low price. The Tiptop Knife is short with an aggressive and extremely sharp blade with slightly serrated edge. Razor sharp stainless blade. Great for slcing fruits and vegetables. Elegant sweet and salty dipping sauce, packed in a glass bottle by Takrai which specializes in specifically this sauce. This is their "Original" flavor. It's very good.